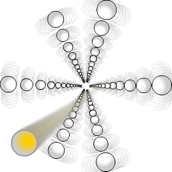 The "Channeling" (International Conference on Charged and Neutral Particles Channeling Phenomena) series are the conferences devoted to new developments in the field of coherent and incoherent scattering of hadrons and leptons (protons, ions, electrons, muons and related antiparticles) in matter of various periodicity structure from the viewpoint of fundamental studies as well as applications. The organization of these conferences based on the traditions of the related successful meetings in Europe, America and Asia (including URSS and former URSS states' conferences) started more than 30 years ago. The first meeting of new series - the "Channeling 2004" workshop (November 2-6, 2004, Frascati) was organized by the National Laboratory of Frascati (INFN LNF). A special proceedings volume of the SPIE - the International Society for Optical Engineering, a co-sponsor of the workshop, (Proc. of SPIE, Vol. 5974) included manuscripts by the presentations at the "Channeling 2004" has been issued. By the subjects discussed, the number of participants and the contributions, the workshop has shown growing interest to the collaboration within the international and INFN projects. The conference represents a unique opportunity for the wide interdisciplinary community to gain information about current and future researches in the field of coherent/incoherent scattering of radiations in matter (crystals, nanoporous materials, capillaries), and in particular for young scientists who have interest in undertaking new investigations following the foreseen development of the next generation photon sources, as well as an important opportunity for exploring and discussing new international initiatives in radiation penetration science, such as channeling of charged and neutral particles and related studies. The program of conference will include invited talks, oral and poster presentations. Sufficient time for informal discussions will be allocated. The "Channeling 2006" conference will be organized by INFN - LNF in the period from 3 to 7 July 2006, which is certainly one of the attractive touristic seasons to visit Rome and the ancient and famous roman area - the Castelli Romani (Grottaferrata, Monteporzio, Montecompatri, Rocca Priora, Rocca di Papa, etc. ), where Frascati is placed. © Copyright 2006. Powered by Macromedia. Webmaster and designer Temir Dabagov .